At Paychi Guh, we believe in quality, comfort, and sustainability. Cashmere is a delicate material that requires special handling and care to preserve the integrity of the fabric. Take good care of your Paychi Guh cashmere pieces and they can last a lifetime. Hand washing is the best way of cleaning your cashmere to preserve the softness and shape of the delicate material. Wash your cashmere garment in a clean sink or a large Tupperware bin. Fill it with cool water (max of 85F/29C only). Use a small amount of baby shampoo (remember, cashmere is hair from cashmere goat) or a gentle wool/cashmere detergent. A good option is the Wool & Cashmere Shampoo from The Laundress. Do not bleach. Do not mix colors; always wash with like colors only. Turn garment inside out to prevent abrasion. Do not tumble dry. Note: Some styles cannot be dry cleaned. Please read care label carefully. Make sure the shampoo or detergent is evenly distributed before submerging garment. Twirl your cashmere garment in water for 3 to 5 minutes, and let it soak for another 15 minutes. Next, rinse thoroughly with cool water until all the shampoo has been removed and the water runs clear. Avoid rinsing directly under running water, as the pressure could stretch the garment. Keep the water temperature consistent between rinses. Press out the excess water as much as possible, but do not wring, twist, pull, or rub the sweater. To dry, lay garment flat between dry towels. Roll garment and towel with pressure to press out excess water. Reshape garment as it dries. Lay it flat on a dry towel to let air dry. Keep away from heat sources and windows. You may iron your 100% cashmere sweaters on the lowest setting, if needed. Leave a distance of 0.4″ or 1 cm between the iron and your sweater; never press the iron directly on your cashmere. Important: DO NOT leave your cashmere blend garment in water for more than 1 minute in order to avoid excess shrinkage. DO NOT machine wash or tumble dry. Certain styles cannot be dry cleaned. Please follow each care label carefully. Make sure the shampoo or detergent is evenly distributed before submerging garment. Soak your garment in water for less than 1 minute. Press out water quickly. Next, rinse the garment by soaking it in clear water for less than 1 minute and press out water quickly. Repeat this process until all the shampoo has been removed and the water runs clear. Clean your cashmere pieces before storing them as body products, oils, and perfumes attract bugs and moths. Fold and store your cashmere garment in the Paychi Guh breathable sweater storage bags. Stay away from storage bags that are made of polyester or plastic. Never hang a cashmere sweater as it will cause the sweater to lose its shape over time. Cedar blocks and cedar sheets are effective moth repellent. Place them in the closets, drawers, or containers where you store your cashmere. A degree of pilling is inevitable for all natural fibers such as cashmere, even for cashmere of the highest quality. Cashmere goes through a special milling process to get the fiber to rub together. Through this process, tightly twisted fibers in the yarn begin to expand, allowing the cashmere to have its amazingly soft hand feel. In other words, in order to achieve the softness of cashmere that we desire, it is a prerequisite that a layer of fiber exists on the surface of the cashmere. Under this condition, whenever this is any friction with the fibers on the surface of the cashmere, they will twist together into small balls and the result is pilling. Pilling is caused by natural friction during wearing. To avoid pilling and snags, try to keep your cashmere knitwear away from rough items such as handbags and jewelry. Pilling will decrease after worn and washed over time. 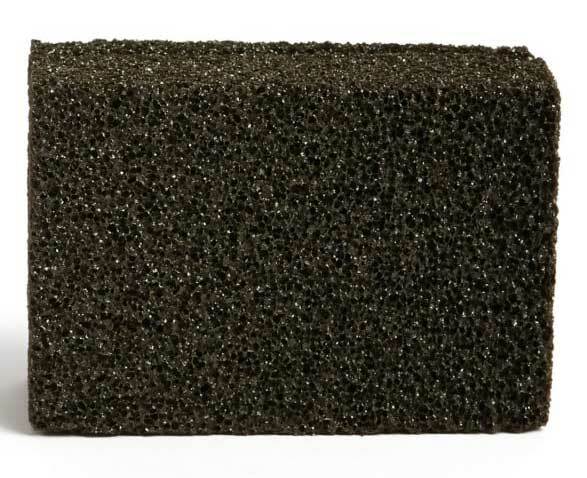 To remove pilling and balling from knits and to renew a sweater’s finish, we recommend using the Sweater Stone, a natural pumice which has the unique ability to lift away pilling. 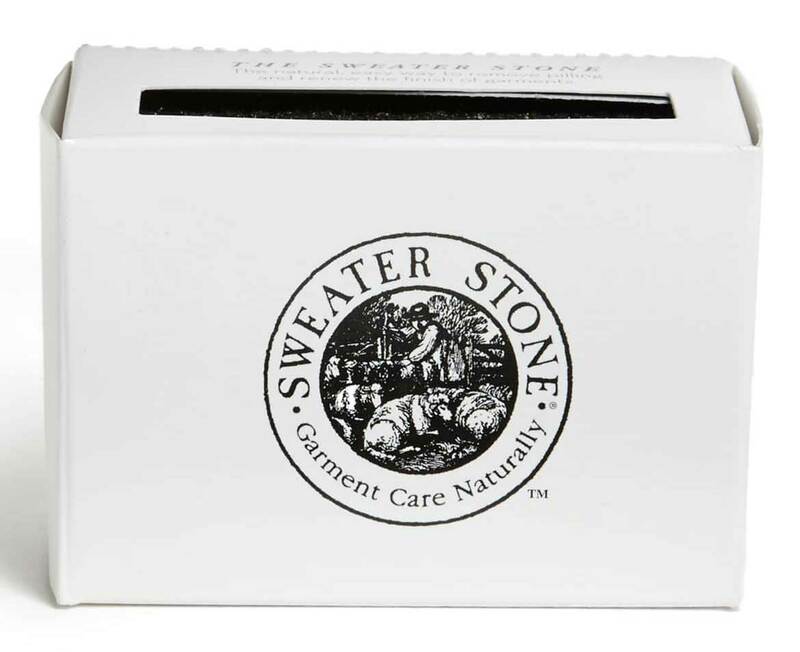 A good time to use sweater stone is after your cashmere is hand washed and dried. After washing, the loose hair comes up to surface and can be easily removed when lightly touched by the sweater stone. A word of caution: Paychi Guh cashmere is super refined, so if you need to use the Sweater Stone on our pieces, make sure to never use the corner of the stone, only rub it very lightly, and always practice on other heavier sweaters first, to avoid damaging the delicate fabrics. We recommend that you remove all jewelry including watch, ring, necklace and bracelet before putting on and taking off your cashmere knitwear, to avoid accidentally snagging the garment. When wearing your cashmere inside an outerwear, choose something with smooth inner lining as much as possible. Also, avoid having items such as pens or wallets in the inner pocket of your outerwear in order to prevent pilling in those areas. Avoid rubbing your cashmere against rough surfaces (for example, garment against your handbag, or sleeves against the desk) to prevent snagging and excessive pilling. Also, be careful not to snag the garment with your belt or bag.